You can never earn enough, so quit trying!Eliminate The Muda! « Stop Fighting Fires – Prevent Them Instead! Mine was not this clean! Over the Thanksgiving weekend I was thinking back on my life and considering not only all I have to be thankful for but also all that I have learned. Many of my thoughts centered on people that have made a difference in my life. Certainly my parents and family topped the list, but there were also several more obscure people that also impacted my life for the better. Within days of graduating high school I had landed a “well paid” (at least I thought so at the time) sales position. My plan was to work over the summer and then head to ECU in North Carolina that fall. A few weeks later my parents announced their decision to move across the country. The thought of moving with them never entered my mind. As a result I found myself having to become a self-supporting “adult” much faster than I expected or planned. 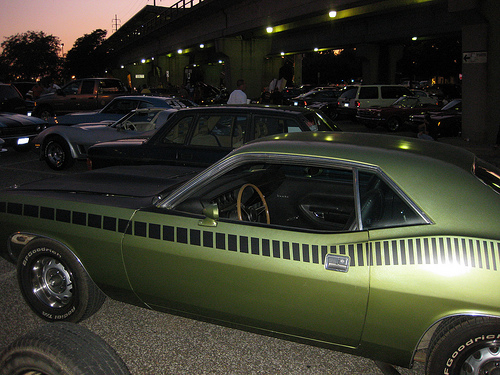 Transportation was already covered, I had a 1973 Plymouth Cuda’. Other than the ongoing costs of food and clothing the only thing I really needed to address was housing. For reasons I cannot really recall, other than the fact that I could “afford” it, I decided to buy a townhouse. Originally, I was thinking I could turn the townhouse into a rental while at school. Being so young, though, I didn’t really appreciate the true costs of owning a house or how fast and deep I would get sucked into the life of an “adult”. It’s amazing the things you don’t learn in school. For example, when you move into your first house you need things like dishes and silverware. The house also needed blinds and a minimum amount of furniture. With a decent job the credit was easy to get. Before long though my credit was maxed as I continued to furnish the house and continued to enjoy my young life. Within 3 months I was deep in debt and having a hard time covering my monthly expenses. Year 3 came and went. And yes, the story was the same. My income increased and so did my expenses and my debt. No matter how much I made, I found a way to spend it. I think the most appropriate term to apply to this approach would be conspicuous consumption. The truth is I didn’t really need much of what I bought. In that span of time I bought a computer, when computers were still an uncommon thing, a new car, I took lavish vacations and filled the house with every gadget a young single man could want. Making $10,000 more each year was not nearly as important as learning how to save a few pennies each day. You can never earn enough to buy everything you want, so quit trying. Instead we should all focus on what is necessary first, living within our means so that we can accumulate savings. Once we have paid our debts and saved enough, then and only then, can we begin to splurge on the things and experiences we want. What is really great about spending money you already have is the knowledge there is still more waiting in the wings, earning interest and growing into a nest egg large enough to provide for you in the years to come. Bill, I am sorry it took me so long to understand what you were telling me, but thank you for sharing your wisdom with me. You were right, and I was wrong, you do have to count your pennies before you count your dollars. How about you, what words of advice were you given at a young age that has proved valuable to you later in life? I am also thankful for the opportunity to be included in the Carnival of Debt Reduction. It’s an honor to be grouped with such accomplished writers. Please take a look at their articles at a great blog called Reduce Debt Faster. 1 comment to You can never earn enough, so quit trying! Carnival of Debt Reduction » Welcome to this week’s Carnival!